It is a well-known fact that the only way out of the Creative Doldrums is to create a way out of them. I think I’ve stated my difficulty with the creative process (and hence, the irony of my chosen profession). About this problem I read a lot. I get a lot of advice. And most of it is at least decent advice. The problem with this is it’s usually of the clinical type. It’s an analysis of the process. And understanding why I struggle is great. I get that. I need that. But at the end of the day there’s still the gap. I’m here. Success (something Created Well) is over there. I have a vision of what I want it to be. Due to my research and received advice, I know HOW to get there. But there’s still this GIANT FREAKING FATHOMLESS CHASM between me and Success. It’s like I’ve got the blueprints (the vision) and all these tools (received advice) to build the bridge…but none of the actual building materials. And so I stand at the edge of the chasm, toes over the edge, staring futilely to the other side. The only thing I know to do is go hunting for building materials. This is the process I go through over and over. You’d think I’d have a good idea where the materials are by now. But it’s not lumber and steel and screws and bolts I’m looking for. I’m not even sure what to call these materials…ideas? No. I have ideas. Ideas aren’t the problem. It’s the execution of the ideas I’m hurting for. I think it’s inspiration. • the divine influence believed to have led to the writing of the Bible. Ideas for me are the easy part. I have lots of ideas. The problem is “having been so stimulated” to realize the idea—to turn the Vision into Success. The problem is I’m not inspired. I’ve found a couple of minor deposits of inspiration lately: Arcade Fire’s “Neon Bible” (the album). 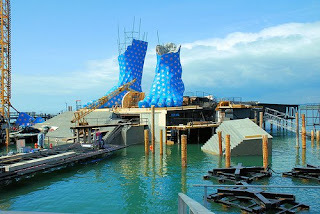 There’s an opera in Bregenz Austria that has a venue called the Sea Stage. Seats 7000. Was featured in the latest Bond (the big eye set). This is the set for their upcoming production of “Aida”. Me=inspired. But not enough to get across the chasm. While the world has spent the last week mourning some guy named Jackson, Nashville has been digging out of it’s own tragedy. You can read about it here. So I’m driving home yesterday and the Nashville sports radio station has gotten Coach (Jeff) Fisher on the air to talk about Steve McNair. I’m not here to get into the circumstances of McNair’s death, and either was Fisher. He merely told stories about his time with Steve. It was honest and refreshing and made me respect this man (Fisher) who already has every ounce of my respect even more. But here’s where I found the building materials. (two parts, I’ll tell part two first). Part 2: After twenty minutes on the air (longer than any interview I’ve ever known the Coach to let happen) the host tells Fisher he has to take a break. He lets the coach off the hook by acknowledging they’ve already gone the scheduled amount of time, but asks him what he wants to do. Fisher says, “take the break. I’ll stick around." And then after the break they take callers. This is a guy well-schooled in the art of question deflection. The first rule of question deflection is control the environment (time/type of question/arena) Fisher, understanding our city’s need to grieve, sticks a pin in the rules to talk to people who he knows will ask the worst and hardest questions. He didn’t have to do this. Me=inspired by Coach Fisher’s selflessness. Part 1: Fisher’s telling McNair stories. McNair wasn’t having a good game. He was making mistakes, getting booed by the fans. And then he gets hurt and they have to take him out. Over the P/A comes the announcement that Neil O’Donnell is coming in and the place erupts in cheers. Fisher describes looking at Steve heading into the tunnel, and seeing the defeat in his eyes. Steve’s given it everything and his fans cheer because he got hurt and had to be replaced. Two weeks later they’re in another game. Steve’s been on the sideline because of his injury. Toward the end of the game the Titans are down by four and O’Donnell takes a shot and has to leave the game. Fisher looks over at McNair, who winks at him, picks up a ball, throws a few warm up passes, then goes in the game and puts the team in the end zone. It’s the wink that gets me. I was coming home from yet another day of crushing creative failure, wondering how to get over it, how to make something happen the next day. Me=inspired by McNair’s resilience. So today I’m winking at my boss and throwing a few warm-ups (this post), then heading in to build that freaking bridge to Success (idea created well). You're more successful than you think.